When people are hungry, they tend to eat whatever “food” is available. A million years ago, before the use of fire or the cultivation and marketing of grains and legumes, hominids in central Africa likely found and ate whatever palatable vegetation was available. Primates in that environment usually eat the abundant edible foliage there. Now, millions of tons of tropical food staples with balanced n-3 and n-6 nutrients are cultivated and marketed (for details, click Table 1). Such foods supported development and evolution of human life with a supply of n-3 and n-6 nutrients and RDA levels of protein and energy (for details, click Figure below). The nutrient combination also gives much more than current RDA levels of dietary fiber and folate. The average omega 3-6 balance score of the foods predicts a resulting tissue HUFA balance of 35% n-6 in HUFA, which is associated with a low risk for chronic health conditions. New food choices came with the development of agriculture 10,000 years ago. Food storage and transport increased as human populations moved to diverse regions of the world where climate and soil conditions caused different grains and legumes with more negative scores to be dominant food staples in different regions (for details, click Table 1). New food technology in the 20th century put seed oils into the food environment for humans more than had ever been available before. This caused a rapid rise in omega-6 nutrients in daily American diets. 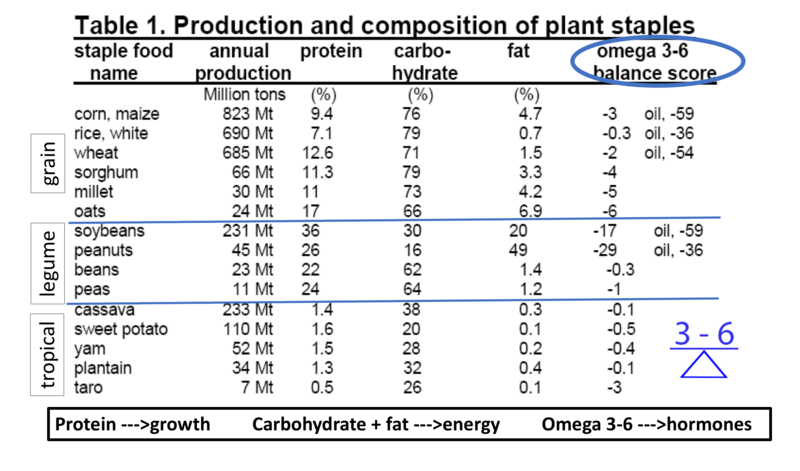 We now see “Western” and “Mediterranean” diets give higher proportions of omega-6 in HUFA than traditional diets in Japan or Greenland. 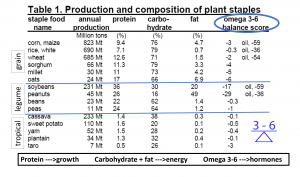 The result of different ethnic foods having different balances of omega-6 and omega-3 EFA nutrients is that proportions of omega-6 in tissue HUFA range from 20% to 85% among different ethnic groups. This can be measured in a simple finger-tip blood-spot test.